On May 20, 2013, Minister of Health Chiu Wen-ta of the Republic of China (Taiwan) led a delegation to participate in the 66th World Health Assembly (WHA) in Geneva, Switzerland. This was the fifth consecutive year in which Taiwan took part in the WHA under the name “Chinese Taipei.” The year 2013, which marks the 10th anniversary of the SARS epidemic, has seen the outbreak of the H7N9 strain of avian influenza. As such, this year’s WHA merited special attention. In the 1950s, the prevention of communicable diseases was the most important public health issue in Taiwan. Efforts made in disease prevention resulted in the eradication of a number of communicable diseases, among them smallpox, cholera, plague, and rabies, within 15 years of Taiwan’s retrocession to the Republic of China. In 1965, Taiwan was certified by the World Health Organization (WHO) as being malaria-free. Taiwan was once known for the prevalence of liver diseases, with hepatitis B being, then as now, the most common ailment. However, since 2000, all newborns in Taiwan have been given a hepatitis B vaccine, and thus there is a very low carrier rate in children of this generation. The percentage of chronic infection of the hepatitis B virus is less than 1 percent, comparable to developed countries in Europe, the United States, and Japan. This stands in stark contrast to the situation in 1980, when some 15.2 percent of adults were infected with hepatitis B virus (the highest percentage worldwide). Such outstanding progress demonstrates Taiwan’s determination to eliminate hepatitis B. With the availability of antibiotics and vaccines, communicable diseases are better controlled than ever. However, new types of communicable diseases can still pose a great threat to public health. When Taiwan’s first case of H7N9 influenza was confirmed in April this year, the nation’s Centers for Disease Control, based on the principles of transparency, openness, and accuracy, immediately reported the incident to the WHO in accordance with the International Health Regulations (IHR). Although Taiwan is not presently a party to the WHO Pandemic Influenza Preparedness (WHO/PIP) framework, we nevertheless comply with its regulations, voluntarily take part in the transparent traceability mechanism for PIP biological materials, and provide virus strains to parties requiring them. Taiwan is also willing to donate vaccines, medicine, and other materials needed for the prevention of disease in a timely fashion to countries in need so as to close holes in the global disease prevention network. In addition to the prevention of communicable diseases, Taiwan has made great progress in preventing accidents. 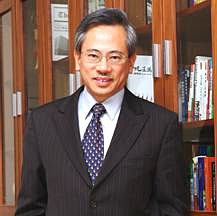 Minister Chiu is a neurosurgeon of world renown. Prior to his taking up his post, he promoted road safety, which led to 1997 legislation requiring the wearing of helmets by motorcycle and scooter riders. This policy significantly reduced the number of head injuries in Taiwan. Accidents have fallen from third leading cause of death to sixth, meaning approximately 3,000 fewer deaths from head injuries now occur every year. This testifies to the importance of promoting both disease prevention and health enhancement, and echoes the WHO’s agenda. The National Health Insurance (NHI) program is another milestone in public health in Taiwan. Since its implementation in 1995, the NHI has removed economic barriers to medical care and increased accessibility. Over the past 18 years, the satisfaction rate for the program has hovered between 70 and 80 percent, and the program’s achievements have been praised around the globe. As a compulsory program, the NHI program covers everyone in Taiwan, and since over 92 percent of medical facilities nationwide are contracted by the NHI program, it is easy for program participants to find care at a medical establishment of their choice. In addition, the NHI has kept administrative costs to only about 1 percent of all medical expenses; provides a full range of medical care and gives program participants high freedom of choice and accessibility; employs a variety of payment systems and a global budget system; and relies on information technology, having issued IC cards to all insured persons to increase administrative efficiency. Introducing a host of reforms, the second-generation NHI program was launched on January 1, 2013. Under this new NHI scheme, a mechanism has been established linking revenues and expenditures to keep fiscal accounts balanced; a fairer cost-sharing format has been put in place that expands the premium base through supplementary premium payments; and the government is taking on a greater responsibility for people’s wellbeing by covering a minimum of 36 percent of NHI expenses. In order to ensure that public healthcare resources are utilized more efficiently, the Bureau of National Health Insurance implements improvement measures each year, living up to society’s expectation that resources be used more appropriately. While Taiwan protects people’s right to access medical care, a freeze is, however, imposed on the NHI cards of those who are financially able yet have not paid their premiums. Transparency of information on medical institutions, including quality reports, finances, bed count, and violations, has encouraged public scrutiny. The second-generation NHI program is paving the way for further reforms that will lead to a sustainable system characterized by fairness, efficiency, and quality. In particular, to ensure better care, promote efficiency, and minimize waste, information technology will be applied to create infrastructure that allows for the comprehensive flow of medical care information. This will give people full access to health information and spur the further development of the healthcare industry. As in many other countries around the world, an aging society presents a major challenge to Taiwan. Developed nations are experiencing this at the fastest rate, having approached in 1993 the threshold of an aging society as defined by the United Nations. They are expected to become aging societies by 2018 and super-aging societies by 2025. For an aging population, non-communicable diseases are a serious threat to health. In Taiwan, such non-communicable diseases as malignant tumors, cardiovascular diseases, diabetes, and chronic respiratory tract diseases account for 80 percent of total deaths. We introduced free Pap tests for women in 1995 and have since seen the standardized mortality rate of cervical cancer decrease by 60 percent (from 10.9 to 4.1 per 100,000 persons). The implementation of the Tobacco Hazards Prevention Act and hikes in tobacco prices have cut the smoking rate among adult males by one-third. Our life-course approach toward health, together with our “whole-of-government” and “whole-of-society” action plan, has created age-friendly cities throughout Taiwan. Taiwan has initiated a plan to create a “golden decade” of prosperity, which aims to achieve the following by the year 2020: a 20-percent decline in the cancer mortality rate (from 131.6 to 106 per 100,000 persons), a 50-percent decrease in the adult smoking rate (from 20 to 10 percent of the population), and a two-fold increase in the number of adults engaged in regular physical activity. In line with the WHO global monitoring framework for a “25 by 25” goal, Taiwan has laid down 9 voluntary targets and 25 indicators in hopes of reducing premature mortality from non-communicable diseases some 25 percent by 2025. We now face the challenge of promoting older people’s health, their fair and continuous participation in social activities, and intergenerational justice. Like other member nations, Taiwan has to cope with the various effects a graying population is having on its public health system. We are promoting important financial reforms such as the second-generation NHI scheme which involves inter-ministerial cooperation, as well as a long-term care program, as part of an effort to create a complete, next-generation social security system. In response to the WHO’s call for disability care, Taiwan is one of a handful of members that has adopted the International Classification of Functioning, Disability, and Health in its disability assessment, which it has integrated into its social welfare system. Given the many challenges in providing next-generation public health care, the global community needs both interdepartmental and international coordination and cooperation to ensure that limited resources are used appropriately to create a global health system featuring universal health coverage and to realize the ultimate WHO objective of health for all. This marks the fifth year of Taiwan’s participation in the WHA as an observer. While in the past unable to participate in the mechanisms and meetings of the WHO, and while participation is still beset by restrictions, Taiwan has made considerable progress in many types of international cooperation on health matters, and Taiwan has not been remiss in repaying the international community by sharing its experiences and successes in the healthcare field. In the 1960s, Taiwan was a recipient of international aid, which amounted to roughly 9 percent of GDP. Today, Taiwan is an active giver of humanitarian aid, annually donating the equivalent of 0.1 percent of GDP. Taiwan also actively participates in global health efforts, supporting the WHO and its global partners’ efforts to achieve health-related Millennium Development Goals. As it seeks to improve its own people’s health, Taiwan hopes for more opportunities to participate in global health efforts, the better to fulfill its responsibility to give back as a member of the global community.